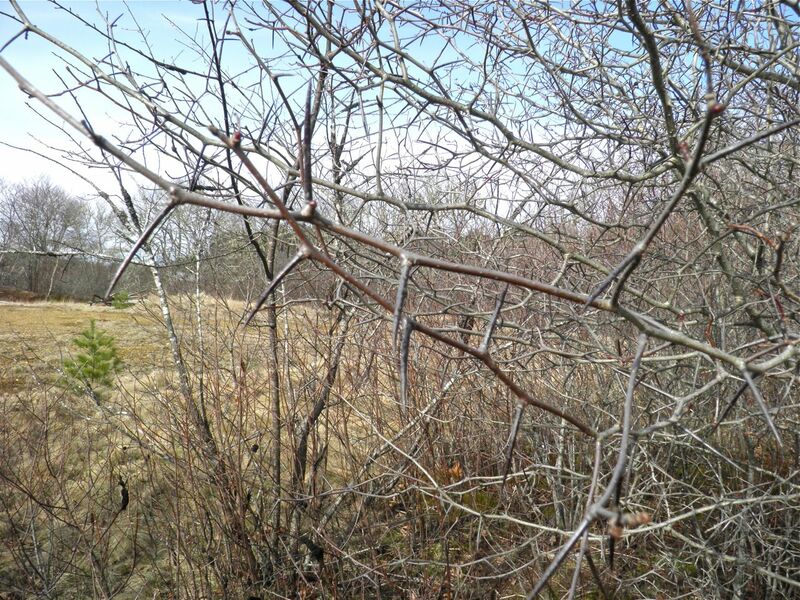 Pear hawthorn is very easy to spot in early spring or winter. 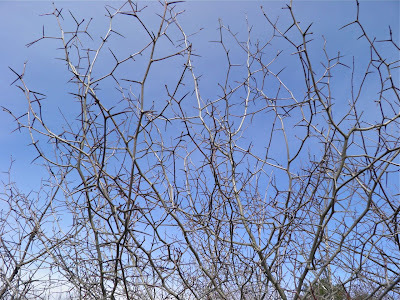 Here’s another plant that is far easier to spot without leaves than during the height of the growing season. 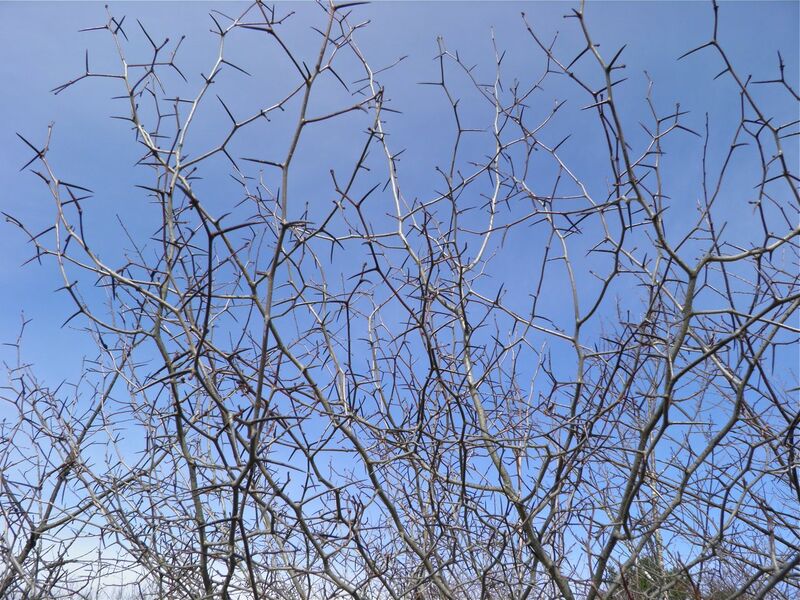 It’s pear hawthorn – so named because of the nasty thorn-like growths on the branches and the fruit (or haws) that is so copiously yields. 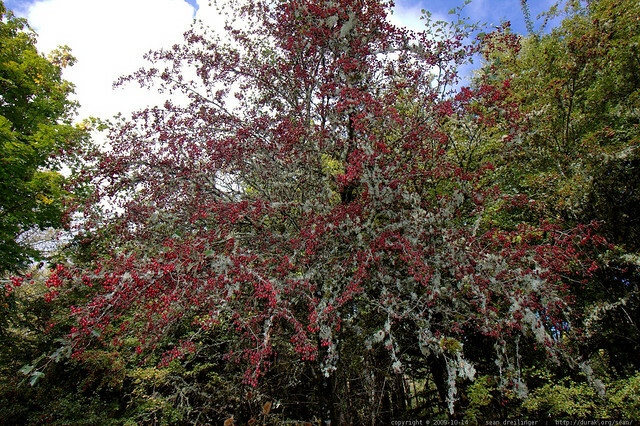 Pear hawthorn (Crataegus calpodendron) is a deciduous tree or large shrub that can grow up to 20’ (6 m). 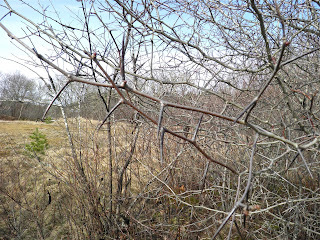 It is distinguishable by the long (about 2”/5 cm) woody thorns that line the branches. 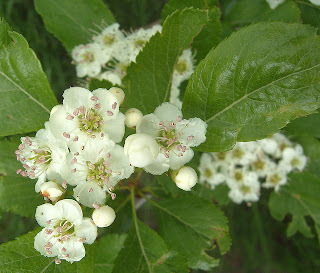 Hawthorn grows in open woods or thickets, often by small streams. Its range is all of Eastern North America east from Ontario and the central USA. It is hardy to Zone 2. It flowers in spring, and the red “pears” ripen in fall. The flowers are self-pollinating because they have both male and female reproductive parts.The fruits (called haws) are edible and have many uses – as a tolerable snack on a hike, to being included in baked goods or in jelly. They need to be hit by frost to develop full flavour. All agree there is a fairly large seed inside so care needs to be taken when eating. 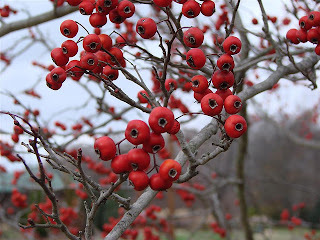 Pear hawthorn, although a tree, is a member of the Rosacea genus, a large family that includes roses, apples, peaches, apricots, raspberries, and strawberries. Members of this family are found everywhere on earth excepting Antartica. Hawthorn can grow in semi-shade to full sun but likes moist or wet soil. It can also tolerate the occasional drought.The plant will tolerate strong wind but dislikes full coastal exposure. It is also tolerant of air pollution, making it a good candidate for a city tree. The name hawthorn is from the Old English “haw” which meant hedge or enclosing fence. Thus the name haw+thorn must mean that at one time these trees were most likely used as natural enclosures. They would be nasty to try to get through for human or livestock. 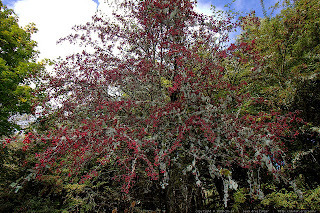 Hawthorns contain substances called flavonoids. Flavinoids are antioxidants. Preliminary research indicates they may counteract allergens, viruses, and carcinogens. The flavinoids in pear hawthorn show potential concerning heart health as well. These include the ability to help dilate blood vessels, improve blood flow, and protect blood vessels from damage. The leaves, flowers and berries have all been used at one time or another for medical benefit. Usually today it is the flowers and leaves because it is believed there is more of the active flavinoids in them than the berries. Hawthorn preparations are used to help protect against heart disease, high blood pressure and high cholesterol. Both animal and human studies suggest hawthorn increases coronary artery blood flow, improves circulation, and lowers blood pressure. It has also been used externally to treat boils and sores. Several studies conclude that hawthorn improves heart function. These studies point to hawthorn significantly improving symptoms of heart disease like shortness of breath and fatigue. One study found that hawthorn extract taken for every day for two months was as effective as low doses of captopril (a prescription heart medication) in improving symptoms of heart failure. Hawthorn may also help combat chest pain (angina), which is caused by low blood flow to the heart. In one preliminary study, 60 people with angina received hawthorn and experienced improved blood flow and less chest pain during exercise. The results need more research before they can be verified. Some researchers think the benefits of hawthorn may carry over to treating high blood pressure (hypertension). This too needs more scientific backing before reliable conclusions can be drawn and published. Remember, medical issues surrounding the heart are very serious. As with any other natural product, you should never try to self-medicate. Ask your doctor before adding this or any other herbal supplement to your diet. Try a haw fruit the next time you stumble across one in the late fall. Depending on who you read they are either a delight or just passable. This may be because they need a few frosts to develop their natural sugars. However you use them be aware they contain a large, hard seed. Because of their copious availability they appeared in many WWII era cookbooks. This is more of a throwback than solely desperation as they were used previously for centuries. For the most part their use had just fallen out of common favour. 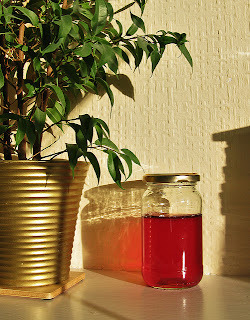 Other uses for haws are in jelly with apples (to which they are related) or tinctures (extraction using alcohol). I have read on another site that they make a more than agreeable schnapps. The liqueur is often served with wild game such as duck, trout or venison, or with cheeses and even cheesecake. Another recipe to try is haw sauce – a classic from Great Britain. It’s a sweet/sour type of ketchup condiment to be used with beef or game. As usual, only harvest from an unpolluted area and wash the fruit well before use. Clean the haws by separating the stems and trimming the blossom ends. Combine the haws and vinegar and simmer for 30 minutes. Press the mixture through a sieve. Return to the fire and mic in the remaining ingredients. Simmer for 10 more minutes and then bottle. This will keep for extended periods in the refrigerator.